A truly connected transport system should lie at the heart of any smart city strategy. The global race to build better connected, more dynamic cities that can thrive in the highly competitive digital economy is well underway. Like every race, it will have winners and losers. The winners in this marathon will see productivity increase and inward investment rise as international businesses open offices, create jobs and drive growth. Cities that can master technologies such as big data and the internet of things (IoT) to improve services and the exchange of information will empower commuters and their respective companies. Those that fail to make the necessary investments to modernise city infrastructure will inevitably fall behind. There are many reasons why this may happen, a lack of a vision, willingness to invest in innovation or take a radical approach to technology change. There has been much discussion about the many ways smart cities can deploy the latest technologies for the benefit of commuters. From connected street-lighting, driverless vehicles to creating greener, cleaner more sustainable working environments, the possibilities seem endless. In addition, the need for driving regeneration, stimulating employment opportunities and tackling climate change are all high priority reasons for moving forward with connected city proposals. Amidst the hype around the latest technology trends, it is critical that planners recognise that transport is the lifeblood of every city and this must be prioritised as part of every modernisation project. It’s not simply a matter of getting from A to B, it’s about allowing access to information about the right journey to take and the circumstances and the status of the transport network. For example, road sensors can help drivers navigate their way through heavy congestion during commuting hours, an approach which in turn will free up the road network. Likewise, access to real-time updates on the train network will enable people to make the right choice about which services to use, and when. Smart city development is also a big business. The high revenues for these projects will not only come from the technology installation but the associated design, consultancy, engineering and deployment of new services. 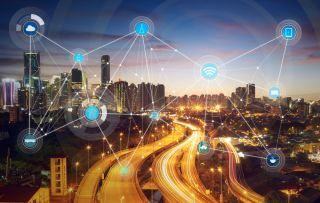 Government reports have suggested that the UK should aim to capture 10% of the global smart cities market, which is estimated to be worth around $40billion per annum. Additional government data states that around 80% of the UK population live in cities, meaning connected infrastructure and smart transport solutions have the potential to make a major impact on productivity. Getting it right may take a lot of upfront investment, but the ripple effects on economic growth are profound. The results of investment in smart city technology are already showing in cities across the UK. There are some exciting examples of visionary IT deployments making a big impact in a very short space of time. Places like Bristol and Milton Keynes have also received recognition for smart city innovation. Hands cited current projects including making use of sensors to monitor air pollution levels, energy usage and water consumption as areas where technology is transforming the way towns and cities operate. In addition, the consumerisation of IT means that citizens increasingly expect public services to meet the same standards they experience when purchasing goods in, say, the retail sector. For example, many workers will expect access to high quality Wi-Fi in their office, home and when visiting hotels or conference centres. Yet when boarding a train as part of their daily commute they are both confused and angry at why on many services this basic system remains unavailable. This lack of connectivity has serious consequences for the economy. Limited internet access means people travelling into and around cities cannot work or answer emails for significant periods of time. This in turn can impact productivity, not to mention proving incredibly frustrating for passengers. Personalisation is also critical to delivering modern commuter services. That’s why the essence of a successful smart city should be framed around its ability to deliver smooth and efficient commuter journeys. This approach will ease congestion, freeing up road and rail networks and ensure people have a diverse array of well-informed alternative journey options in the event of an accident or breakdown of train services. The rail transport system can benefit from an injection of technology on many levels. With cancellations, delays and overcrowding often citied as serious problems from the rail network, there is an obvious case for IT to improve the situation. By deploying business intelligence technologies, the network can monitor services and ensure smooth traffic management. This data can also be relayed to people through mobile apps and digital signage so that people can make the right decisions about how best to travel, depending on the circumstances of the hour. There are other reasons why the UK should master the development of connected transport and connected city initiatives. A major one is for export opportunities to sell services abroad. By combining transport expertise with big data analytics and the latest software platforms, other countries will want access to our expertise if they see it in action supporting our great cities. So for smart cities to truly succeed, they must be designed around the needs of the citizen. That’s why building a truly connected transport system is so critical to our success in the future. A city cannot remain an economic powerhouse if it operates on outdated systems and lacks the connectivity expected as standard around the world. Failure to invest and install this essential infrastructure will have disastrous consequences for the long term. In contrast, an efficient system will drive economic growth and increased productivity. In turn it will encourage inward investment and enable businesses to thrive, leading to job creation and increased prosperity. To take a quote from Shakespeare, “What is the city but the people?”. With this in mind, our smart city strategy must support commuters as its number one priority.